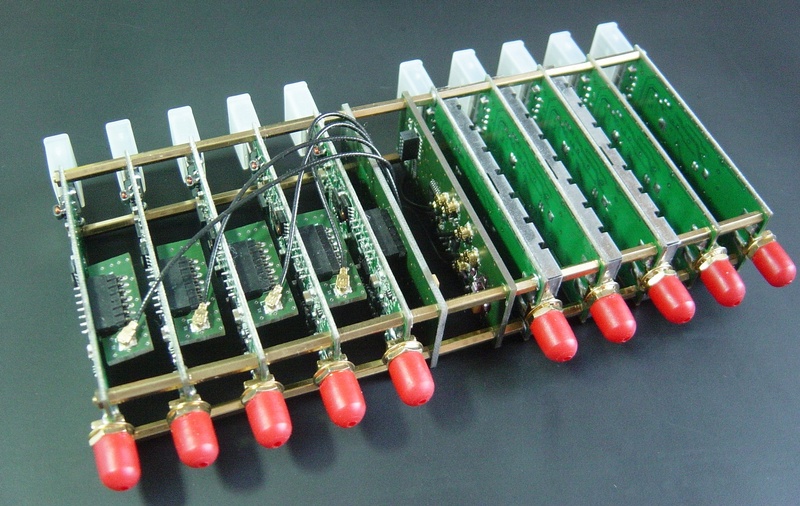 We offer different models of multi-channel coherent receivers to meet your requirements. The main characteristics of the coherent receivers are described in the section “Coherent Receivers”. The current realization of the single channel receiver is based on the RTL2832U/R820T2 chips. We plan to add support of other single channel receivers in the future. All our models have been designed to be as flexible as possible using integrative construction components, thereby, a configuration change of the whole system (e.g. number of channels, addition of different filters, converters etc.) easily possible. The problem of the integrative components is more important when the system supports N-channel architecture and when it is necessary to add N-filters or N-amplifiers during the configuration change. The usage of non-integrative components leads to unnecessary connection cables, additional PCBs, etc. We offer different types of extension cards (or RTL2832U-shields). These cards either enhance the characteristics of the single channel receiver (e.g. Filter or Band Extensions), or are used as building blocks to construct the coherent receivers (e.g. Clock or Expansion Cards). Please refer to the section Channel Receivers and Shields for more information. Our receivers are not closed systems. We offer the documentation and provide the description of how to build the coherent receiver using the RTL-SDR v.3 dongle. All necessary components for this purpose can be found in the section Accessories. Do you have dual channel coherent receivers suitable for radio direction finding with software available? I am looking for ones for a passive radar network for both natural scatters and aircraft scatter dopplers on the low VHF 49.750 MHz TV channel. This far I have used only single ch rx’s like RTL dongles with HDSDR and traditional ham SSB receivers with Spectrum Lab in my experimental passive radar network but these do not allow direction finding. Among aircraft dopplers I am constantly receiving scatters of natural electric high sky discharges like high altitude ‘sprite’ lightnings at a rate of about 100 discharge scatters an hour. There are means to locate familiar surface lightning strikes but yet no passive receiver networks to routinely indicate and locate these high altitude natural scatters. If there were practical dual ch rx’s with interferometry radio direction finding software it would make possible to create receiver networks for locating high altitude discharges. A new kind of blitzortung.org style thunder radar indicating those high atmosphere lightnings that are not shown with this far lighting rx’s. 2. Four channels direction finding were done by our commercial customers; most of them wrote own software that is not in the public domain. You can also take a look to GNU Radio modules from EttusResearch (https://github.com/EttusResearch/gr-doa). These blocks work with RTL-SDR with a small modification. 3. 49.750 MHz is on the lower end of RTL-SDR but should still work. 4. Regarding to your description; may be it makes more sense to use 12 bit or 16 bit SDR; how strong the signals? 5. May be it makes sense to think about the distributed coherent systems based e.g. using GPSDO? We you have ideas or alternatives, we can discuss them. Do the receivers has the same LO clock ?